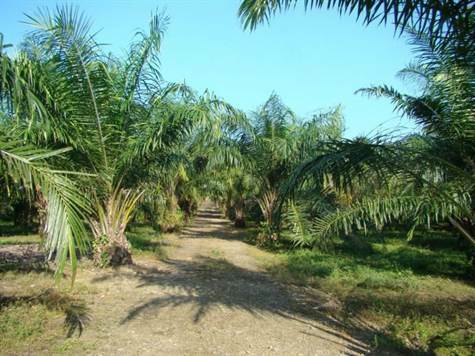 Property located in hills of Quepos are presenting a property, which is defined as follows: It has 90% of African palm, which has an age of 5 years, it is producing 20 metric tons per hectare. The property has Palma Tica contracts which expire in 2014. This farm has two bedroom cottages concrete. It has all utilities. Has beside the Rio straws of the same is taking a concession. The whole area has palm drains or ditches where they cross the waters. Also, have a yard and sheds where machines are stored. The property is located 3 kilometers from the coastal south, has 2 kilometers with road frontage on both sides. It is located just 10 minutes from downtown Quepos where we can find many attractive places as community and tourist developments, the airport in Managua, not forgetting the Beautiful beaches we have in our area, as National Parks and recreational areas for the Family.